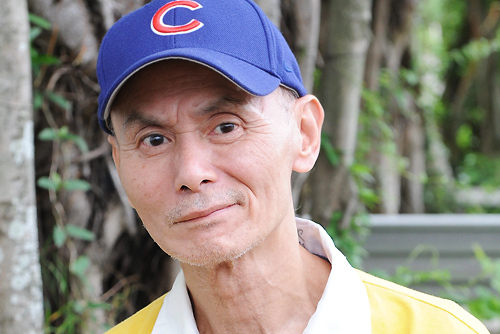 During September 2011, Gordon Liu (劉家輝) suffered a stroke that left him paralyzed on one side of the body. Regaining the will to continue with life as a stroke survivor, Gordon is currently rehabilitating at a nursing home, undergoing physical therapy, and receiving acupuncture and massage treatments on a weekly basis. Gordon reportedly regained approximately 40 percent of mobility since his stroke. Although the medical expenditures are more than $30,000 HKD per month, Gordon was able to cover his own expenses. According to his manager, Eva, Gordon does not have any financial problems. Immediately after Gordon’s stroke, a family dispute erupted when his second wife, of Thai nationality, and his two children aimed to seize all of Gordon’s financial assets. Gordon continues to refuse seeing his wife and two children from his second marriage. However, he does not feel lonely due to his numerous friends. During this year’s Mid-Autumn Festival, many of his colleagues and friends from the movie industry visited Gordon at the nursing home, including Ti Lung (狄龍), Chan Koon Tai (陳觀泰), Amy Fan (樊亦敏), Willie Wai (韋家雄), and Vincent Lam (林偉). Although Eric Tsang (曾志偉) and Vivian Lai (黎瑞恩) did not visit Gordon during the Mid-Autumn Festival, they especially sent moon cakes, allowing Gordon to spend a warm and happy Festival. Although Gordon is still frail and weak, he is in good spirits. Gordon’s manager, Eva, and Amy Fan are constant visitors at the nursing home. For the Mid-Autumn Festival, Amy even gave Gordon a red packet to wish him luck. Gordon was especially excited when Chan Koon Tai and his si hing, Chow Keung (周強) came to chat about martial arts. Chan said, “When you are ready, we will fight again,” while they performed Kung Fu gestures to cheer Gordon up. According to Eva, there is a foreigner by the name Joe who originally wanted to be Gordon’s kung fu disciple. Unfortunately, Gordon suffered a stroke and could not fulfill Joe’s dream. Out of respect, Joe came back to Hong Kong to visit Gordon. Ti Lung stopped by with essence of chicken and snacks. He grabbed Gordon’s hand and give him words of encouragement, and told him not to be bothered by media gossips and rumors. Willie Wai, who costarred with Gordon in the RTHK comedy, Rooms to Let <有房出租>, and the crew from the show knew Gordon loved shrimp dumplings, so they took Gordon to eat dim sum. John Chiang (姜大偉)–who portrayed Gordon’s brother in Rooms to Let–could not attend the dim sum party, but called to check on Gordon. Vincent Lam and the RTHK Fire Speed <火速救兵> crew also spent the festival with Gordon sharing soup and great food. Eva revealed that many colleagues from TVB also called and wished Gordon good health. Gordon has been making good progress and he remains sharp-minded. When friend visited with his pants’ zipper down, Gordon noticed it right away. That’s good news. Hope his health continues on a positive note. Hope that Gordon continues to improve his health and comes back to the screen… best of luck and wishes to him!! Great to know that so many great friends came to see him. HE aged so much, lost so much weight.
. both of them lost too much weight and it makes the body look stressed butyou CAN recover from it. he can bounce back, i know this because i myself went through three strokes since last year. it is not easy but you can regain everything you had, and even come out of it stronger then before. gordon liu could even outlive me by miles, he’s been in martial arts for most of his life! all of his training would also help the body to become stronger and more able to withstand things like this. so gordon where ever you are, DONT GIVE UP! your much closer, you can make it! know you can bounce back and make a great big comeback! my family and i wish you the very best! English title is “Rooms to Let” not Rooms for Rent. Correct that. You’re full of knowledge about RTHK dramas…I made the correction. Thanks. Glad that he is improving but don’t like the slow improvement i.e only regained approx. 40% after 1 year. Suffering a stroke usually diminishes life-time mobility for most patients. Recovery is most marked within the first 6 months and regaining agility afterwards is very difficult. Therapy can help and regaining strength is another critical necessity. I think Gordon’s immediate aim may be to regain greater strength and rely less on his wheelchair. The greatest threat for most stroke victims is a second, more serious stroke and suffering a fall, which may lead to bone fractures. Thx for the info Jayne. Just hope he can fully recover or at least be able to participate in a series again like Michael J. Fox. Thr stroke made him get old so fast. I send prayers, love, and healing light.